The Sanyo HDMI VPC-FH1 Camcoder Manual has been published by sanyo manufcturers. It's available in pdf format (3.4 MB). On this manual you can find important information about camera setup, operation and troubleshooting guide. 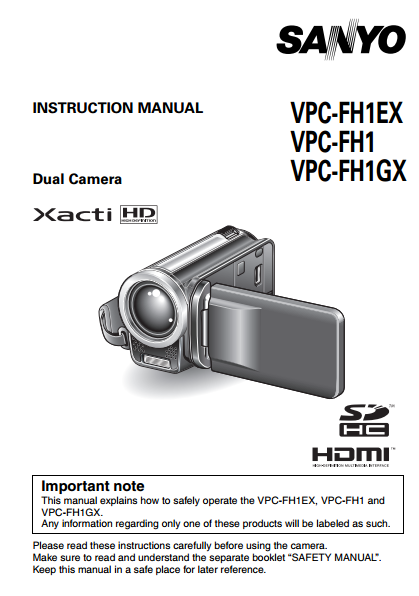 Actually this instruction manual also for VPC-FH1EX and VPC-FH1GX type. The manual contains reference information such as learn about part names on page 22, installing the card on page 24, how to use the remote control unit on pahge 25, date and time setting on page 38, shooting guide on page 57, using the autofocus on page 58, using the flash on pge 66. Then in the Sanyo HDMI VPC-FH1 owner's manual also provide detail reference information such as about using playback on page 73, using recording menu and filter setting on page 85, face chaser setting on page 98, digital zoom setting on page 100, file protecting setting on page 104, editing vide clip on page 108, printing instructions on pge 117. Other important information such as storage folder setting on page 129, TV output setting on page 132, and torubleshooting on page 161. Especially about troubleshooting for example the flash does not operate, the digital does not work, no playback image appears, the image is too dark, no image or sound, cannot edit or rotate an image, the remote control unit does not seem to work, etc. Don't forget you can read about other camera operation via commonly asked questions on page 153 for example why doesn't the power turn on, which resolution setting should i use?, how can i get the distant view into focus?, why is the image to bright?, can i use my camera abroard, and more.